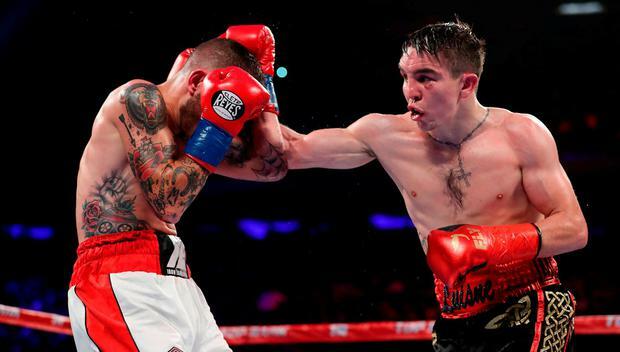 Former Olympic bronze medallist Michael Conlan claimed his seventh pro victory with a shut-out points win over Ibon Larrinaga at Madison Square Garden last night. The Belfast brawler easily accounted for his opponent with the judges all returning 80-72 scorecards after the eight-round bout. Conlan will now turn his focus to a homecoming bout on June 30. The 26-year-old was fighting on the undercard of Vasyl Lomachenko's clash with Jorge Linares. Ukrainian Lomachenko won his third title in as many weight classes after stopping Linares in the 10th round in New York. Lomachenko had the upper hand at Madison Square Garden until he was on the opposite end of a right-hand from the Venezuelan in the sixth. But the 11-1 man, known as Hi-Tech, pulled himself from the canvas and, four rounds later, dispatched a perfect liver shot to draw the bout to a close. In doing so, the 30-year-old twice Olympic champion became the fastest fighter ever to win titles in three different weight classes, adding the WBA Lightweight strap to his collection. The bout was relatively tight until the decisive blow was landed - with both fighters ahead 86-84 on one judge's scorecard, while the other had it at 85-85. The loss was the first for Linares, 32, since March 2012 when he went down to Mexican Sergio Thompson.